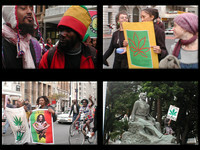 Marihemp Network Gallery :: 2005 Global Marijuana March. Photos for many cities. 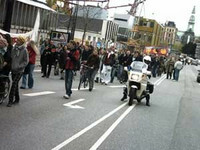 2005 Global Marijuana March. Photos for many cities. 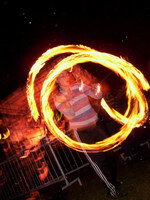 Awesome photos at the above link. 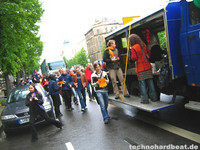 Huge GMM/MMM 2005 crowds shown in Budapest, Madrid, and Rome. Photos from other cities, too. If one site is down, then try the other. Click on any image below to enlarge it, or to open an album folder. Feel free to use or edit any image. 2007, 2006, 2005, 2004, 2003, 2002, 2001, 2000, 1999. Photos. 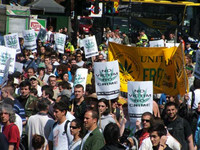 Cannabis events, campaigns. 2007, 2006, 2005, 2004, 2003, 2002, 2001, 2000, 1999. Posters, flyers, banners. No need to login or register in order to upload. 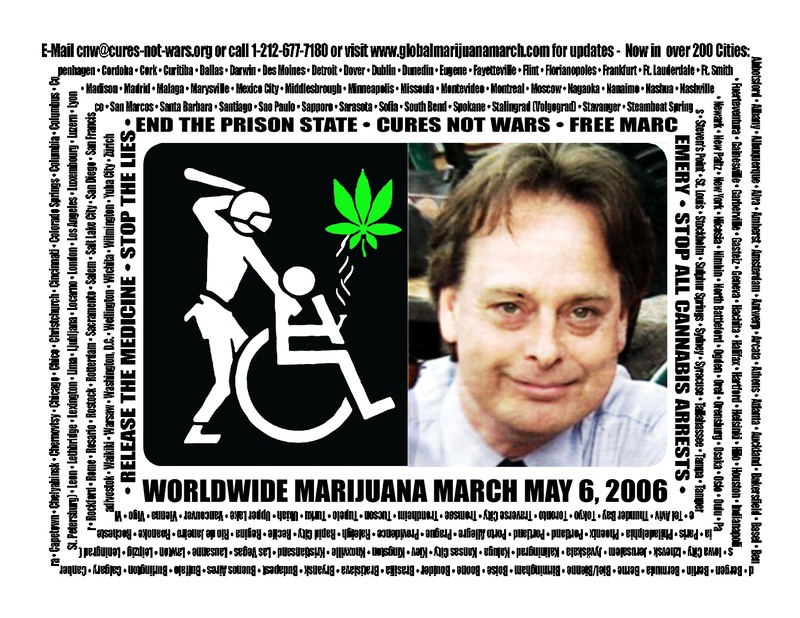 Please put comments, URLs, and questions in the webform at the online contact page: http://corporatism.tripod.com/webform.htm - Please send in web address URLs for web pages with cannabis event photos, posters, flyers, videos, and banners. Also, let the gallery editor know of insulting comments added to images, etc., so that they can be deleted. Besides the online form, you can contact the gallery editor by using the email address tents444"at"yahoo.com (substitute @ for "at"). Be sure to use some English words like GMM, MMM, Marihemp, cannabis, marijuana, marihuana, etc. in the email subject title line so that the email is not mistaken for spam and ignored. The characters for languages other than English may not show up correctly in the email. If you don't get a reply, resend the email with a different email title. Messages are lost for many reasons. Keep trying! Album: Amsterdam, Netherlands. 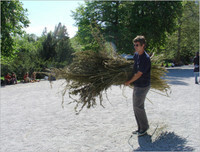 May 7, 2005 event. MMM joined up with the Stop Bush rally. 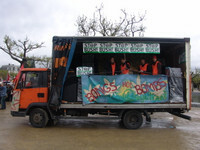 Banner says "Bongs not Bombs"
Album: Athens, Greece. 2005 MMM. Album: Belgrade, Serbia. GMM-MMM 2005. Album: Boise, Idaho, USA. 2005 MMM. Album: Boulder, Colorado, USA. 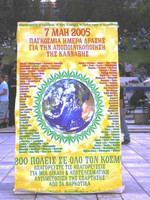 2005 Global Marijuana March. Album: Budapest, Hungary. 2005 MMM. Album: Buenos Aires, Argentina. 2005 MMM. Album: Cape Town, South Africa. 7 May 2005 MMM. 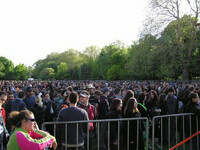 Global Million Marijuana March. Album: Christchurch, New Zealand. GMM-MMM 2005. Album: Copenhagen, Denmark. 2005 MMM. Album: Kiev, Ukraine. 2005 MMM. Album: Leipzig, Germany. 2005 MMM. Album: Ljubljana, Slovenia. 2005 MMM. Album: London, UK. May 15, 2005 MMM. Album: Madrid, Spain. 2005 MMM. Album: Mexico City, Mexico. 2005 MMM. Album: Missoula, Montana, USA. 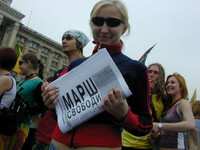 2005 MMM.